The legendary boxer in his role as senator. Will he be able to wear both hats this year? Manny Pacquiao will have to box clever to meet his senatorial responsibilities with plans for a four-fight farewell tour this year. Already, the 38-year-old welterweight has confirmed a fight with Australian Jeff Horn on April 23. It has also been announced by promoter Eddie Hearn today (Wednesday, January 11) that talks are underway for a bout with Britain’s Kell Brook at some time later in the year. Although the venue for the Horn fight is yet to be confirmed, promoter Duco Events said today that it could be in one of Australia’s major cities, possibly Horn’s hometown of Brisbane. Alternatively, venues in the Middle East or the United States are being considered. “The preference for all parties is for the fight to be held in Australia, and we are working towards this outcome,” said Duco director Dean Lonergan, who met with Top Rank chief Bob Arum this week to confirm the fight. Arum said he wanted the fight to be held at an outdoor stadium. The fight will be broadcast in about 160 countries, timed to be shown at a prime-time Saturday night slot in the USA on free-to-view television. It is a nine-hour flight from Manila to Brisbane. Horn (16-0-1) is a 28-year-old former schoolteacher who fought at the 2012 London Olympic Games. He is ranked at number two by the WBO in his weight division. 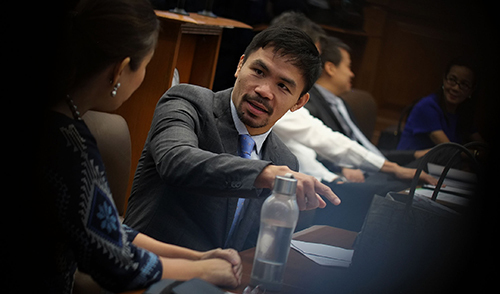 Pacquiao is the WBO champion in that division while also sitting in the senate. Horn’s last fight was a knockout of South African veteran Ali Funeka in Auckland, New Zealand in December. The fights are likely to help the PNP reach its crime targets for 2017. As we describe here, during Pacquiao’s fight against Floyd Mayweather Jr in May 2015, there were no recorded crimes within Metro Manila whatsoever. The same phenomenon was noticed during his fights against Chris Algeiri in 2014 and Juan Manuel Marquez in both 2008 and 2011.